I had a great trip to Little Rock, and the Thea Art Show went well. I sold work and came back with money. One of the challenges facing arts organizations is that too many corporations fail to understand the value of the arts. In difficult or trying times they tend to become fixated on the bottom line. Thus they too often chose the path of avoiding risk at all costs. But creativity and advancement of human culture come only through willingness to risk exploration of out-of-the-box notions. One of the directions I want to explore for the Eureka Springs School of the Arts is that of building partnerships with area corporations that express the value of out-of-the-box thinking, and demonstrate how it can be accessed as a routine pattern through the arts. Engagement in the arts provides tools and resources for problem solving even when those problems seem far removed from the nature of the art in which one is engaged. It does this through our human capacity to extend the boundaries of thought through the use metaphor. For instance, early rocket engineer, Lovell Lawrence, Jr. discovered how to keep rocket engines from burning out while staring at a plate of spaghetti and noting how the pasta wrapped around the fork. He wrapped fuel lines around the venturii in the rocket engine, and thus preheated fuel and cooled the engine at the same time. 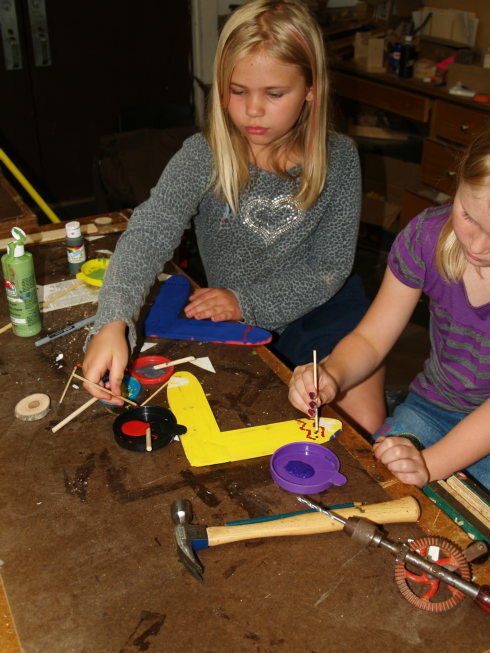 Participation in arts and crafts provides a framework for creative problem solving (studio thinking) too often ignored, neglected or rejected in corporate life. One of the places actively at work in building partnerships in the arts is the McColl Center in Charlotte, North Carolina, though their Innovation Institute. Schools, too, are constantly pushed toward the bottom line, and it may seem ironic that the best way to engage the heart and mind is actually through the creative use of the hands. I have applied to become a presenter at this year's ISACS Fall Conference. 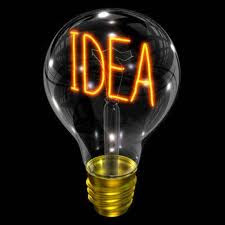 The theme of this year's conference is Innovation: Thinking Outside the Box. As a creative box maker, that subject should be right my my alley. "Frederick, Elector of Saxony, had two sons. Always at war, his enemies at length sent Kunz von Kauffingen with other soldiers to the Castle of Altenburg, July 7, 1455, to carry the two boys away. Kunz went off with Albert, Mosen with Ernest. Kunz neared the Bohemian border by noon on July 8th, but, as Albert was thirsty, stopped to pick bilberries in the wood. A charcoal burner suddenly appeared, and at once guessed this was the boy about whom alarm-bells were ringing throughout Saxony. He fought Kunz with his long poking pole (Schurbaum) till help came, or, as he expressed it to the Electress, when she thanked him, "Hab ihn weidlich getrillt"; and he is called merely "Triller" in the legal documents conveying to him and his heirs rights in the Saxon forest for ever. This Albert is ancestor of the present Saxon house. Prince Ernest was rescued on July llth. Twelfth in direct descent from him was Albert, the late Prince Consort; the Prince of Wales is thus thirteenth." As children learn the depths of their communities and the nobility of each part played within it, their minds and hearts open to their own strengths and possibilities. Even craftsmanship involves aspects of the heroic. Today I am leaving for North Little Rock and the Thea Art Show. 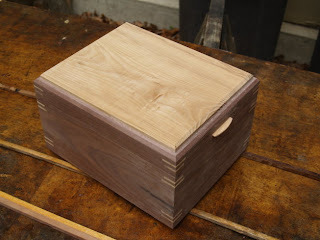 Yesterday I completed a box (made of walnut and ash) to be delivered at the show and shown in the photo above. The following is from Friedrich Froebel's notes on his classic book Mother play (Mutter und kose Lieder) regarding the charcoal-burner. Froebel portrayed the charcoal burner, as lowly as he might appear, to be a person having noble purpose in the larger scheme of things. In Mother Play, Froebel used songs and finger play to engage the child in learning about his family, his community and himself. And in doing so, he described a method in which mothers could become purposefully engaged in preparing their children for school and later citizenship. 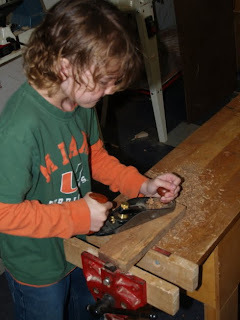 In this short piece you can see Froebel's recognition of the importance of hands-on learning. Without the charcoal burner, where were most of our technical arts? Without his patient labour, where were those chemical researches which have solved so many of the secrets of Nature? God, by Sir Charles Bell. Published as one of the Bridgewater Treatises, 1832 ; ninth edition, 1874 (George Bell & Sons, Covent Garden). ** ironically, in his time, Froebel was accused of being insufficiently "Christian". "We have recognized the eye as the medium between man's inner being and the spiritual world. In like manner the hand is a special medium between the inner life and the surrounding material world." "Theories of moral training vibrate between the equally pernicious extremes of coercion and feeble indulgence, because thought oscillates between the perceived necessity of doing right and the instinctive sense that virtue implies voluntary choice, and that power to choose aright can only be developed by long exercise in right choosing. It seems at times that by a slow inversion the outward may become an inward "must" and the imperative of external command melt imperceptibly into the imperative of conscience. Influenced by this latent assumption we make much of formal obedience, and expect that by some subtle process of moral alchemy mechanical habit may be transmuted into spontaneous energy. In the recoil from this view arises the conviction that external drill and discipline tend not to fashion the will, but either to break or stiffen it, and with a burning feeling of the sanctity of the individual soul we denounce the outer compulsion which cramps, fetters and destroys the free energy of spirit." There is a third path toward the evolution of moral children within a moral society, that being craftsmanship. Today, I am preparing for my show in North Little Rock on Saturday, and working on a box to house the ashes of a woman's husband. I am trying to turn that project into a short article to publish either on the Fine Woodworking website, or in my box making blog. "The care of animals and plants is important for its influence upon the intellect as well as for its influence upon character. It is needless to do more than allude to the fact that what the child cares for he will observe and study, and that hence gardens and living pets form the best possible introduction to botany and natural history. Many suggestions with regard to the transition from care-taking to observation, from observation to systematic study, are to be found scattered through Froebel's writings and should be carefully pondered." Most schools, however are so fixated on standardized testing that they have little or no time anymore for such wonderful things. Later the first, second and third grade students came to wood shop to finish their boomerangs, by painting them in the aboriginal Australian fashion, with small dots of paint. The boomerangs are part of their study of the continent and nation of Australia. Those of us who have hands take them for granted. Some folks have sufficient creative spirit despite lack of hands to make examples of their own lives to inspire the rest of us. There is an element within the human spirit that aspires to nobility, but our failure to understand the values inherent in craftsmanship can lead us to seek our own nobility in meaningless places... Having rather than making, appearances rather than joyful service to others. This video is informative. Yesterday I ordered SawStop table saws for Clear Spring School, the Eureka Springs School of the Arts, and for my own wood shop. I am shipping an order today and preparing for the Thea Art Show in Little Rock on Saturday. Thea Foundation is an organization founded by the family of an artist from North Little Rock, Thea Kay Leopoulos, who died at the too young age of 17. The foundation was created in 2001 to promote the arts in schools, and the art show on Saturday will support its efforts. Do something to celebrate your hands today. A distinctive element of the Clear Spring School hands-on educational model involves getting kids to where the action is, thus building a relationship with the whole of their world. Our students begin their school travel in 4th grade, by traveling around Arkansas, and slipping occasionally into neighboring states. This year the 4th, 5th and 6th grade students will be going to Memphis, the home of the Blues, and the Civil Rights Museum. Our 7th, 8th and 9th grade students will be going to Washington, DC, and our 10th, 11th and 12th grade students will be spending a week in St. Louis. In the past we've had students travel to the 4 corners area, follow the path of Louis and Clark into the Northwest, journey into the southern swamps in search of the Ivory Billed woodpecker, and work in the clean-up from the devastation of New Orleans. These are not simply travel experiences but involve weeks of planning and study in preparation. Today and tomorrow are departure days for school travel. The Memphis and Washington, DC groups left today, and the St. Louis group leaves tomorrow. So I had high school classes this afternoon and will have lower elementary on Wednesday. On Friday I leave for a one day art show in North Little Rock, and having kids out of town this week will allow me a bit of extra time in my own wood shop to prepare. I have boxes to finish and boxes to make from scratch. 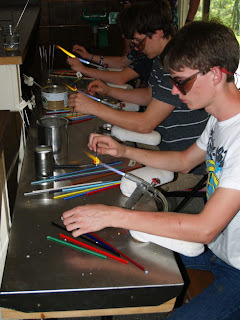 We are also rapidly approaching the month of May, one of our busiest times in the art world of Eureka Springs. During our May Fine Arts Month, I will have my work in two exhibits and the White St. Art Walk. "I am 64 years old and started carving about 10 years ago as a form of anger management. Rather than employ a shrink, my husband thought it cheaper and wiser to provide me with an 8-ft. pole, and angle grinder, a Dremel with carbide bits, and a grinder. When a woman feels disempowered, a wise man provides her with power tools." There you have it in a nutshell. When we create things through our own hands and from our own imaginations, not only are we smarter as we do so, we feel better and even those around us are relieved by the joy we find in our work. The photo above is of some of our guests at Saturday's Wisdom of the Hands Reception and Fundraiser. Our students helped guests to make tops. We had a great time and raised even more money that we had hoped. The following is from Susan E. Blow,"Symbolic Education", 1894, as she describes the importance of play in Froebel's educational method. "the error of all formal teaching is that it imposes a result without reproducing the experiences through which it was reached; The characteristic of all vital teaching is the development of ideas in the order of their origination. For every thought has its pedigree, and it must be generated in the mind of the individual as it was generated in the mind of the race." "The heir of all the ages must enter upon his inheritance before he can become the instrument of their increasing purpose. He must recreate the simple arts through which man first asserted his dominion over nature. He must dream over again the dreams of Reason preserved for him in myth and fable. He must stand before the Pyramids, and solve the riddle of the Sphinx. He must fight for Helen before the walls of Troy, and break the power of the Persian upon the plain of Marathon. He must march with the Roman legions to universal conquest, and, sinking himself into the depths of the Roman spirit, evolve therefrom the conception of universal law. He must feel the anguish of the nations 'sitting in darkness and in the shadow of death,' and behold with the awe-struck shepherds the dawning of the world's light. He must learn reverently the lesson of those ten silent centuries which found voice in Dante, then hasten to England to win the victory of Runnymede, and sit at the feet of Shakespeare. He must sail with Columbus over unknown sea, land with the Pilgrim on Plymouth Rock, draw the sword with Washington, and standing with Goethe on the heights overlooking Valmy, behold in that momentous battle the birth of a new era. Thus only can the world into which he is born be born again in him, and the aspiration of his age become the aspiration of his soul." "The object of education is to aid the effort of the individual to ascend into the life of the species." The idea was that human culture must arise again in each new generation, a sentiment reflected also in the writings of Finnish Professor, Matti Bergström, and that arising takes place through play. According to Froebel's view, "the individual can develop only by actively reproducing within himself the experience of mankind." In order to touch that spirit and experience, I propose that students be challenged to participate in "noble notions" that lead them to exceed their (and our) thoughts of their own limitations. I have recently joined the board of Clear Spring School to serve a three year term, and spent the last two days in the CSS annual board meeting. This afternoon the Wisdom of the Hands program was honored by the school and by friends through a fund-raiser/reception at the beautiful home of Jim and Susan Nelson. CSS students Oakley and Alena were on hand to teach the making of wooden tops and each guest was invited to take home pinwheels that CSS students had made. It was a lovely afternoon. Money was raised for my school program, and I am grateful for the support. "No student of childhood will challenge the assertion that its most characteristic manifestation is play. What flight and air are to the bird, play is to the child; it is both his distinctive activity and the element in which his life moves. In play he suffers the constraint neither of alien will nor of the self-imposed purpose, but exercises an activity which is its own end and its own reward. To study him in his play is, therefore, to study him when he is most himself..."
"The same instinct which impels the baby to push with his feet against his mother's breast inspires the child's love of running, leaping, wrestling, and throwing. The delight he feels is in the consciousness of force; the stimulus to exertion, the resistance to be overcome. Moreover, by measuring himself against others he compels them to recognize his strength, and thus satisfies that craving for recognition which is at all times the deepest hunger of the human heart." One cannot spend time in a city park or on school grounds without witnessing the child's inclination to test his or her own strength and physical capacity. The same is true in wood shop. My first grade student, Conner has a fascination with the vises mounted to each of our CSS workbenches. Smushing things in the vise is an irresistible inclination for him. The vise imparts super human strength, and with it a child can feel his own power. In Conner's fascination with the vise, you can see the truth of what Susan E. Blow's described as, "the consciousness of force." In other words, play is not a thing to take lightly, and wood shop is not just wood shop. 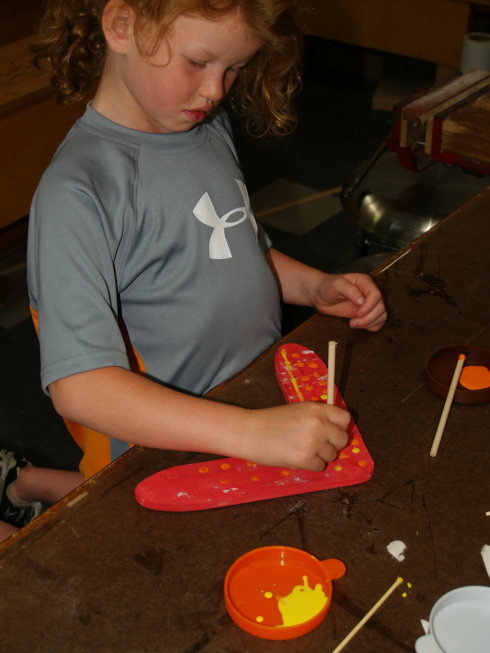 Today in the CSS woodshop, first, second and third grade students made boomerangs. They were reluctant to leave them at the end of class, but the glue was drying and they will be delivered to them on Monday to paint in an aboriginal style. 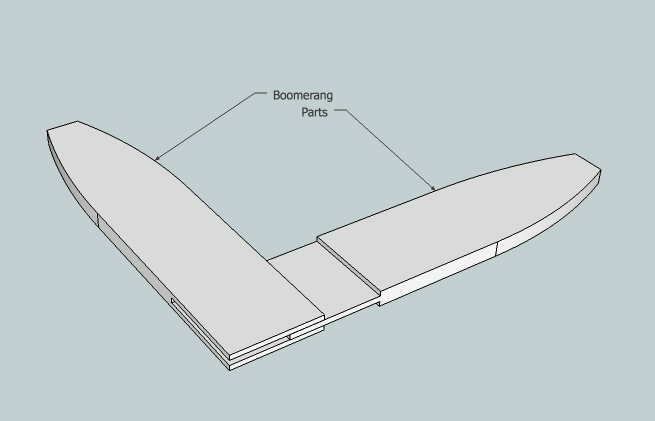 My boomerang plan is shown above. Not shown is the amount of sanding required to make it really work. Kids don't really have the patience for the shaping required to make it really come back. "... to continue to fill the child's mind with foreign material, under the gratuitous assumption that at a later age he will be able, through some magic transubstantiation, to make it a vital part of his own thought... is like loading his stomach with food which he can not digest, under the delusive hope that he may be able to digest it when he becomes a man. It is forcing the mind to move painfully forward under a heavy weight, instead of running, leaping and flying under the incitement of its own energy and the allurement of its own perceived ideal. "Thus to load the young mind is a grievous sin; but we commit a yet more heinous offense when we insist upon the exercise of faculties whose normal development belongs to a later age. The child is sympathetic, perceptive, and imaginative, but he is incapable of sustained observation and repelled by analysis and logical inference. The very flowers he loves so dearly become more instruments of mental torture when we constantly insist upon his analyzing and classifying them. The attempt to force a premature activity of reason can result only in the repulsion of his sympathies and the stultification of his mind." Thus was play understood to be the primary instrument of learning.The following link is about flipping the classroom and flattening the school walls. Children of all ages need to be doing real things. This morning I woke up thinking about parent/school partnerships, and the challenge that comes when any member of the partnership lacks in some area of understanding related to effective communication. It seems that effective communication has been well studied and there are great resources to use to help all come to a better understanding of each other. About 40 years ago as a social worker in Memphis, working with emotionally disturbed children at a private agency, we took a class in Thomas Gordon's Teacher Effectiveness Training as staff development. Then many years later as my daughter Lucy was was in first or second grade at the Clear Spring School, my wife and I took Thomas Gordon's Parent Effectiveness Training, and relearned the conflict resolution method practiced regularly at the CSS, even to this day. As the years have passed, however, many new parents and children have come to the school without the communication resources that study of Parent Effectiveness Training can provide. If I've aroused your curiosity, you can find many free resources on the Gordon Training International website. It is amazing how much time is spent in schools dealing with interpersonal distractions that require conflict resolution and active listening. Interpersonal communication problems cut seriously into the time available to the lessons at hand. To have all those associated with a school skilled in interpersonal communication would be a true gift to education and to each child. 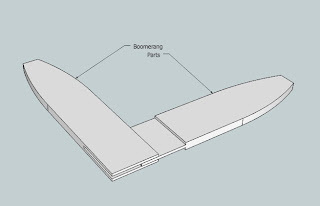 This morning I was at school preparing for tomorrow's class with the first, second and third grade students, in which they will make boomerangs for their study of the continent and nation of Australia. In addition, I have been preparing for a Wisdom of the Hands fundraiser/reception on Saturday, April 21. All guests will have the opportunity to make tops, and carry home pinwheels made by CSS students. Charting the value of hands-on learning is challenging. We can measure learning in one of two ways, either statistically or by personal observation, and each side of the equation is distrusting of the other. I have been curious how teachers assess and foster spatial sense in the absence of music and the arts. We know that those things we do not assess, tend to decline in importance to us, and it appears that standardized testing ignores spatial sense, even though we know it is crucial to success in a variety of fields, including science, the arts, and mathematics. Some of this involves the perceived divide between the left and right sides of the brain, with the left being primarily analytical and verbal and the right being "intuitive and spatial, pattern recognizing, non-verbal." You might enjoy the contribution to the subject in this blog, Learning to see. The question I must ask is can we standardized test ourselves to the point of utter stupidity and ignore the essential building blocks of intelligence? Or shall we learn to consider and teach the whole child? On another subject, I spent a few minutes today watching our first grade students at work on the monkey bars... (Technically called Brachiation Bars.) Ana was having difficulties beginning to read until introduced to the monkey bars, but the movement of one hand over the other helps to develop deliberate cross talk within the brain and is noted as a means to prepare the brain for reading. This relationship between the body and reading readiness was a thing observed by so many early educators. The mind and body are not separate things, and the hands themselves form the best symbolic representation of the body's presence in learning. Each of the children on the monkey bars asked me over and over, "Watch this!" Being watched attentively by caring adults as children do things that they perceive as being dangerous, and involving risk, is a child's favorite thing, and Ana had many new tricks to show on the monkey bars that are also expressed through her advancement in reading.Just as we need partnerships between parents and the school, we also need an understanding of the partnership between the hands, brain and body in learning. "From the sixth year on, the children are taught from books. Is it at all surprising that they think it is from books alone that knowledge is to be obtained? A bright child has therefore no other desire than to get books and to study out of them. The acquisition of knowledge by his own observation, by his own efforts, is something that our present education does not teach him. This is left for after school hours, because it is still believed that the teaching of facts should be the main feature of all educational systems." Heusinger believed that schoolwork and instruction should be based on experiences gathered by those closely observing the growth of children, and that manual work should be the primary means of education, as "it satisfies the child's natural desire for creating and imitating." These days, children are being taught that the internet is the source of all knowledge, though many of us know that personal observation of physical, cultural, intellectual and emotional realities should not be ignored. We may in time end up with schools that resemble big box stores and through which you will check yourself out at a register, no real teacher required. But we would be better served with lives and educations based on real observations. Put a tool in a child's hands and he or she will learn many real things, even about self and more. On another note, my Building Small Cabinets DVD is now in the warehouse at Taunton and I'll be receiving my first copy in days. It should be available through Amazon.com and other sources including direct from Taunton Press. The cover is shown above. 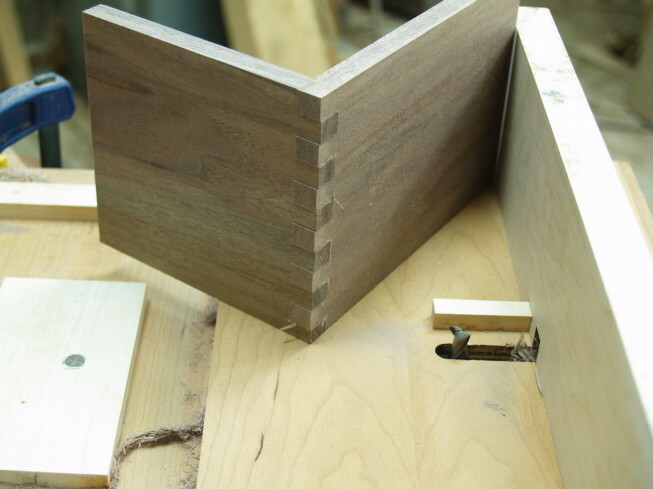 On still another subject, Tim Killen has offered a sketchup demonstration on designing a project for young woodworkers on the Fine Woodworking Website. He makes sketchup look very easy, and it might be a project for you to do with your kids. Over the weekend, I applied Danish oil to boxes and shipped an order to Appalachian Spring Gallery in Washington, DC. There is pleasure in watching the wood come to life as the oil is applied. Getting the finish just right requires careful rubbing and wiping of each piece. The finish also reveals any small scratches that have been missed in the sanding. So the craftsman learns to apply diligence at all steps. There is also pleasure in shipping and selling my work. It provides cash for the household expenses and also provides the excuse for me to make more. The photos above and below are from today's classes at the CSS wood shop. The 4th, 5th and 6th grade students had a practice day learning safe and careful hand tool work, including planes and 3 kinds of hand drill. They asked when they arrived, "What are we making today?" "Evidence of learning," I replied. The idea was not to make anything specific, but to simply take a piece of walnut, and use it to learn the actions of the various tools, planing the surfaces flat, squaring edges and drilling holes. Ozric, a 5th grade student said, "this is the best day of wood shop ever!" Among the lessons learned in the use of hand tools is to be aware of your own body. As I explained to the kids, you can run a game controller while flat in bed, but to use real tools requires a sense of your own relationship to the earth and to the work at hand. 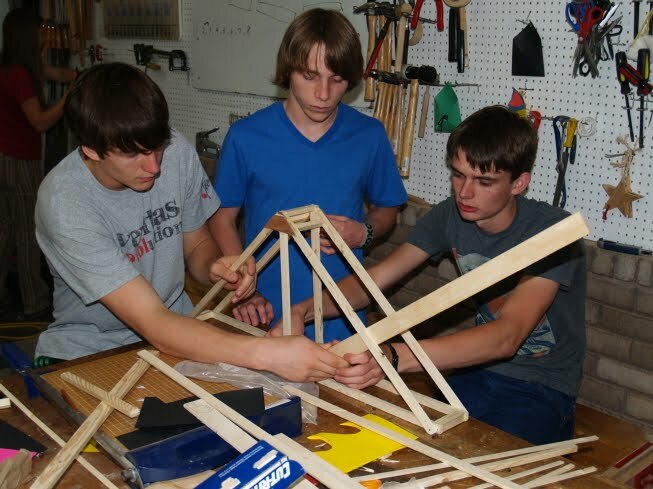 The high school classes finished their bridge building. All students are more excited about learning when they are able to test tools, materials, skill and attention in their own hands. Children, these days, are entered into the world of flat screen, two dimensional digital technology at an early age, while in an earlier time, children were deeply engaged in a three dimensional world, playing with blocks, scissors, folded paper and string and doing real rather than virtual things. Early introduction of digital technology makes children adept at moving icons around on flat screens. Blocks, scissors, paper and string lead to an understanding of the physical world in which children live. Parents naturally think that giving their children expensive devices is a great gift, when in fact, they might instead give them more valuable gifts and experience at far less cost. One of the problems we have at Clear Spring School comes from the parents providing high tech devices to their kids without serious restrictions on their use. Too many hours of sleep lost in video gaming leads to poor attention, short tempers, situations arising that require staff time for conflict resolution and poor performance in school. Staff time could be just as easily and more pleasantly invested in those kids who come to school eager and ready to learn. Early introduction and unsupervised use of digital devices (and television) leads to neglect of other essential building blocks in the child's understanding of physical reality, and diminish the child's capacity for effective social engagement. One of our high school students finally decided on his own that the only way for him to catch up with his peers and graduate would be for him to go cold turkey on his Play Station II. Recognizing his own addiction, he surrendered it to friends with the instruction, "Please, don't let me see this thing again until after graduation." This decision came only when confronted with failure. But schooling would be so much better for all if such realizations could be made at the parental level and before the student faces school failure. Literacy in the classically linguistic sense means that someone can read, write, and speak in a language. Those abilities can be seen in all aspects of our existence: in spoken and written communications in everyday life, in the workplace, and in science. Spatial literacy follows a similar pattern: people draw upon their spatial knowledge, their repertoire of spatial ways of thinking and acting, and their spatial capabilities to solve problems in all aspects of their lives. 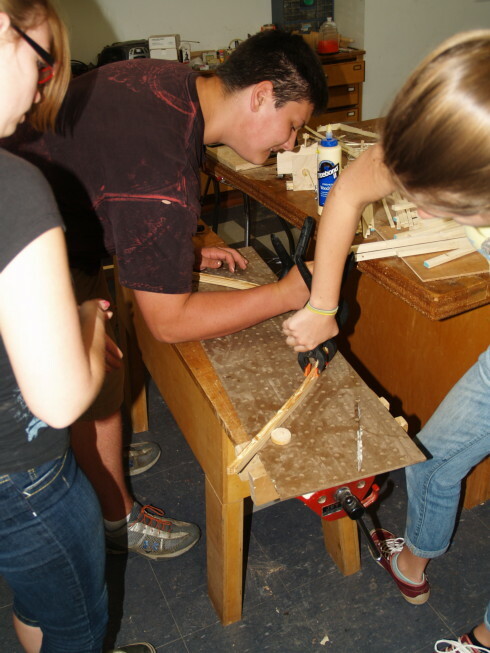 One of the ways to develop spatial sense and spatial literacy is to become engaged in woodworking. Another is music. Yet another is through 3-dimensional art. If we want our children to be real problem solvers (rather than virtual ones) we need to give them the necessary tools and experience, and here I'm not referring to Play Station II. We use our hands to bridge between the concrete and the abstract, bringing abstract objects into scale as we visualize their creation. 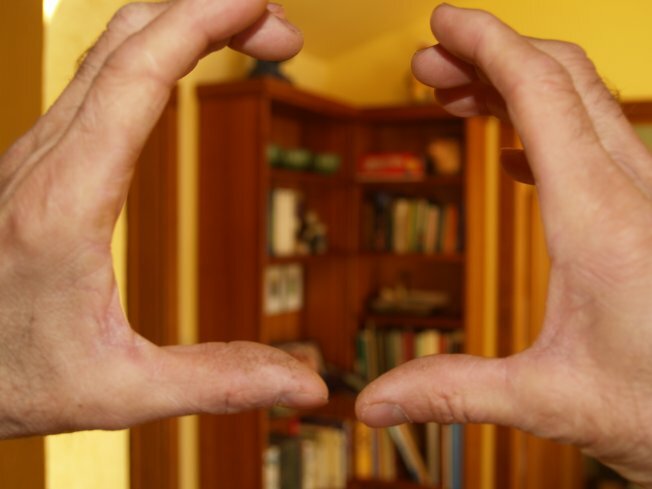 We use our hands to frame distant things, bringing them into more meaningful context. The simple gestures, at left and below will be well known to you. You have used them yourself as you transition from the imagination to reality, of from reality to imagination. The use of the hands helps to create a sense of scale and proportion. Otto Salomon in Educational Sloyd suggested that education always move from the concrete to the abstract. The hands are a much overlooked tool for making that transition seamless and personal. The gesture above is the one commonly used to "create" objects. The gesture below is commonly used to bring distant objects into scale or to frame landscapes in painting and photography. Both are useful for engaging the imagination. Today we have an open house at the Clear Spring School. Hours 1-4. Stop by and you will see crafted wooden objects in each classroom used in the development of interest in learning, but also in the development of spatial sense. On a related subject, Mother Earth News is celebrating International Homesteading Education Month. The magazine has long served in advocacy of direct hands on learning, enabling readers to get a grip on their own lives. One can even set up quite ridiculous cases. A cat is penned up in a steel chamber, along with the following device (which must be secured against direct interference by the cat): in a Geiger counter, there is a tiny bit of radioactive substance, so small that perhaps in the course of the hour, one of the atoms decays, but also, with equal probability, perhaps none; if it happens, the counter tube discharges, and through a relay releases a hammer that shatters a small flask of hydrocyanic acid. If one has left this entire system to itself for an hour, one would say that the cat still lives if meanwhile no atom has decayed. The (wave) psi-function of the entire system would express this by having in it the living and dead cat (pardon the expression) mixed or smeared out in equal parts. It is typical of these cases that an indeterminacy originally restricted to the atomic domain becomes transformed into macroscopic indeterminacy, which can then be resolved by direct observation. That prevents us from so naively accepting as valid a "blurred model" for representing reality. In itself, it would not embody anything unclear or contradictory. There is a difference between a shaky or out-of-focus photograph and a snapshot of clouds and fog banks. Does any of that seem similar to what goes on in a classroom as teachers attempt to assess the value of student work? What goes on the mind of a child is as obscure to most observers as is the state of the Schrödinger's quantum cat. There are distinct challenges in teaching a classroom of students and anyone who has taken a bit of time to observe the workings of his or her own mind will know that human attention can be observed in either wave or particle states. The cat is either dead or alive to the experience of learning. The mind can fixate on a single point, or it can fade in and out, drawn hither and yon between the moment, the past and the future. When a teacher stands before a classroom of kids the likelihood of all being intellectually engaged at the very same time is small. Even the most effective and engaging teachers are challenged to keep all student attentions on that which is assumed each must be learn. But student attention is much more generally like a wave than a particle of singular focus. Within the minds of any of his or her students is Schrödinger's cat either paying attention to the lesson or dead to the moment perhaps to suddenly rewaken or then again die a thousand deaths as interests ebb and flow, wax and wane, and as connections within the brain are made either by the instructor's lessons or by other distractions in the room that lead each student's consciousness hither and yon. It seems what we've accepted in American education is at best a blurred model, a fuzzy cat neither dead nor alive. No doubt, as you were reading this you needed to do some mind wandering of your own... what a great chance to observe how the mind works. The teacher standing at the head of the class often has no real idea whether the cat of attention is dead or alive. And sometimes lessons learned will not really become apparent until years down the road. Lessons are a bit different when students are directly engaged in making real objects that express useful beauty. Within each student engaged in real things, whether music, making or laboratory science, the quantum cat is most certainly alive. Richard Bazeley, shop teacher from Australia sent a photo of his children's work and asked how we can develop an assessment process that takes account of the work's value and content. Others here in the US are working on the same thing. You will recognize the Clear Spring School Math Facts Box. In it, I can observe his student's care in their making of it, persistence in its completion, creativity in its expression. These vlues do not necessarily fit a statistical assessment like that demanded in most educational environments. Fortunately, at the Clear Spring School, we can assess student performance and student engagement according to non-statistical values. With our objective of fostering life-long learning, the ability imparted to the child to reflect on one's work through self-assessment takes on greater importance than 3rd party assessment by teachers or administrators. Most assessment schemes place an incredible, almost impossible burden on teaching staff. For instance, in Richard's case, he has 24 students to shepherd through the process of making the math facts box. There more than enough for him to do just to keep his students safely engaged and to offer personal instruction where required. The ideal would be for students to develop skills of self-assessment. That is one of the important things that comes to light through the "Child as Craftsman" metaphor for education. Light provides a useful analogy for examining education. After all, we have traditionally described learning as a form of illumination. Remember the great enlightenment? Yes, it was a bit before our time. I know some readers may regard what follows as wacky. I speak of the interconnectedness of all things. My wisdom of the hands project began in the recognition that woodworking was not an isolated activity, but one which drew upon and made connections with the whole of human culture, so instead of woodworking, and wood shop being irrelevant to our children's educations, it could become central. My program was designed to prove that point. We know that we can regard each thing, each person, each object within the world as isolated, just as we can regard mathematics as being a discipline separate from all its diverse applications in physics, chemistry, art, music, or wood shop. But math has broader meaning than what can be recorded in a spread sheet, or a careful column of numbers added, multiplied, or divided and set in relation to each other or tabulated as fact. So it is. We see each thing distinctly as object, or on the other hand as a broad range of relationships between objects set in motion through time. One approach simplifies for the sake of convenience and standardization in instruction, but ignores the vast complexity of physical, emotional and cultural realities of being a child or adult in the real world. Light can either be observed as photons, observed as tiny bursts of particle energy, or observed through its more relational attributes, as patterns of waves whose apparent form is dependent on the framework of the observer in relation to the light's source. Your assessment, is it this or is it that, is dependent entirely on your choice of tools through which you make your observations. Just as in the observation of light, in learning and in education we can choose an objective framework that measures particles of learning, or we can choose a relational framework that ties the child to matters of community, character, family, nation, leading the child to a sense wholeness within that matrix. One method of approach can be seen curently in American education with the extreme focus on the use of standardized testing to measure learning just as one would record the arrival of photons of light on a photographic plate. The other framework for guiding education and learning was that described by Comenius, a reasoned and rational set of observations of children as they engaged in exploration of relationship to the physical world. Just as in the observation of light, we can choose to see learning in one way or the other. The choice of view is mutually exclusive. Children are either drawn into a world of wholeness, or something tragically less. The interesting thing is that when children are directly engaged, hands-on, learning what seems relevant to them, forming strategic connections with all things, they learn more quickly, and to greatest lasting effect. 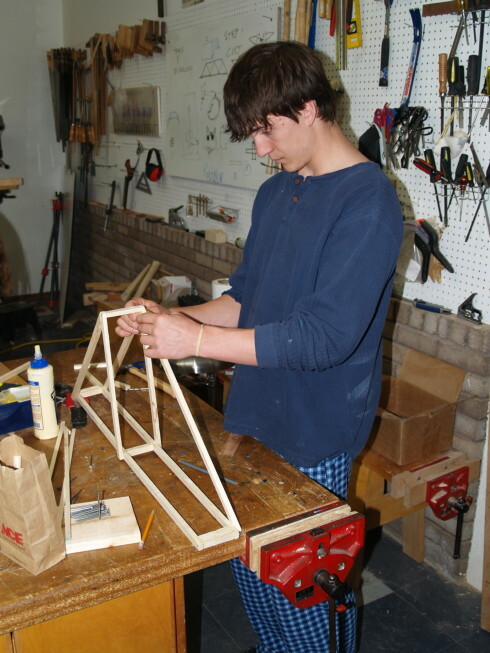 Today in the CSS wood shop, our high school students worked on their bridges, just as I am attempting to illustrate the essential bridge between mind and hand. There are still openings in my 2 week summer class Creative Box Making at the Center for Furniture Craftsmanship in Maine. I am excited about this class. Not only will it take me to a beautiful part of the US that I haven't visited in many years, it will offer a full two weeks with a select group of 12 students to work and to think outside the box. We will develop new designs, new skills and new techniques and push our own limits in creative box making. 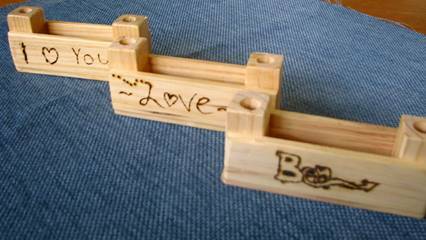 In most woodworking classes, students are encouraged to make very specific designs, copoies of the teacher's own work. In my classes, I encourage students to feel confident in coming up with designs of their own. Students will not only gain skills in the making, but also skills in the designing of beautiful and useful boxes. I got an email from a student enrolled in one of my classes. He asked, "Can you provide a cutting list prior to the class?" But how could I offer a cut list for a box that is still germinating in the student's own hands? From beautiful wood, and personal inspiration, we will make boxes. The dates are June 18-29 and class size is limited to 12 students. The tendency is still to create a culture representative of caste. Notwithstanding the modifications in the scope of the school forced by the industrial democracy, such as are signified by technical, commercial, and manual-training departments in the midst of cultural studies, it must be acknowledged that the leisure class theory of education is still in the ascendent. The benefits of even the public schools, supported though they are by general taxation, accrue to an intellectual aristocracy. The divorce between the hand and the brain, which is destructive of any genuine integral education, continues in full force. The time has come for schools whose aim shall be to serve the needs of modern industrial democracy, that shall build upon that fine instinct for workmanship that is the very life of industry when not permeated by caste, schools that shall declare: "The ideal university is a place where nothing useless is taught." It belongs to an aristocracy to support the useless-- useless garments, ceremonies, athletics, learning and whatnot as the sign of an ability to indulge itself in reputable expenditure. As my students worked in wood shop yesterday, I asked about their current block, Civics. The 7th, 8th and 9th grade classes are preparing to go to Washington, DC for 10 days, and they have been meeting with the local mayor, county government officials, our state representative and learning about all things having to do with the government at all levels. The culmination will be to visit our nation's capital. It is so difficult to learn just for its own sake. The mind and heart are best engaged when we perceive actual use for what we learn, and my students complained that Civics is so hard for them to get excited about. "What use is it?" they asked. And sometimes seeds are planted in what we learn that may not be of immediate use. But learning comes at the speed of light when actual usefulness of learning is made perfectly clear. A good teacher charts of course of useful experience. Today the first, second and third grade students at CSS will be using their workshop time to make airplanes for their imaginary travel to Australia. In Educational Sloyd, the objective was to start with the interests of the child, then move incrementally from the known to the unknown, the easy to the more difficult, from the simple to the complex and from the concrete to the abstract. Each of these pairs describe an aspect of the journey to an understanding of the interconnectedness of all things. While a teacher or a professor, after years of study and personal investigation may understand the relationship between physics and math, and from there begin to extrapolate this interconnectedness, even into music, literature and the arts, it is not something that can be presented artificially from without and thence fully grasped, but must come in some degree from an understanding achieved within each child. For that reason, Educational Sloyd sought the measured and incremental growth of each child. 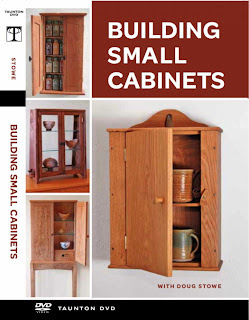 Teachers of woodworking would be the same teachers who taught the child reading and math, rather than someone who taught within a separate, isolated discipline under silo-like conditions. Teachers were encouraged to teach each child individually rather than as a class so that no opportunity for vital connections would be missed. Instead, we have a system of education in which students are written off as problems, as students who will not achieve, will not perform, as we revel in a false glory of those who do succeed. What a different planet we would live upon if all or most children were brought to an understanding of the interconnectedness of all things. Today I've been writing the text for my article on a dedicated finger joint router set-up and fine tuning my outline for a book on hands-on learning. This afternoon, I will have 7th, 8th, and 9th grade students in the wood shop. 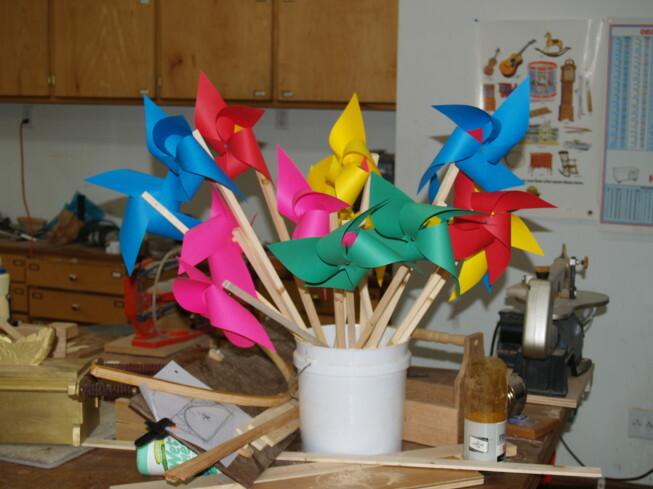 This morning the 4th, 5th, and 6th grades students finished book making, and helped make more pinwheels. 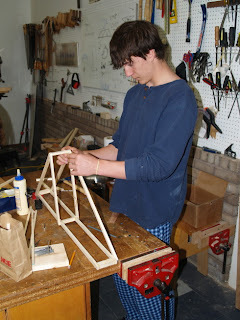 The high school students worked on bridge building as you can see in the photos. 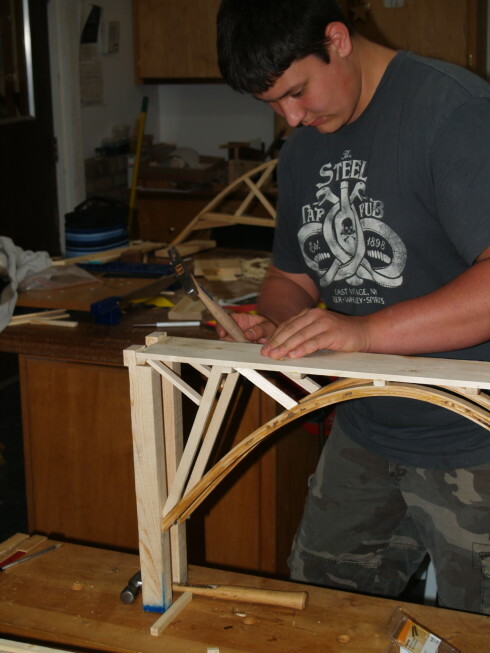 A wide range of bridges are being built, from simple spans to more complicated arches and trusses. At the end of next week we will be ready to test the bridges for strength. Early books on Educational Sloyd offer insight into why all children should be engaged in wood shop. The following is from T. C. Horsfall, J.P. and his introduction to John D. Suttcliffe's Hand-Craft, a text book for Slöjd. The reason for desiring the introduction of manual training into Elementary Schools might have been expected to suggest itself to all persons who are acquainted with the conditions under which the mass of English people live; but experience gained in Sweden and other countries where the Sloyd system has been largely used, proves that there are also strong educational reasons for desiring that Sloyd shall be introduced into all English Elementary Schools as soon as possible. It has been found that this admirably graduated system of training not only fosters deftness of hand and correctness of eye, as it might be expected to do, but also has distinctly moral and intellectual effects, as it promotes patient attention, steady application, and interest in work to a very high degree." "Its effect on many of the large class of children who, though not dullards, show lack of interest in, and deficiency in the power to understand, the subjects comprised in the ordinary school curriculum, has been most beneficial. In their Sloyd lessons many of these children have found themselves the equals, some more than the equals, of companions far their superiors at book-work, and have by this gained a confidence in their own ability which has often reacted on their power and their will to conquer their other lessons. Thus many children who, when they first began Sloyd, were distinctly below the average in intelligence, have become under its influence completely 'normal'." "All persons who know how badly prepared are the majority of the children who now leave our Elementary Schools for gaining rapidly skill in the work by which they have to live, or for taking an intelligent interest in their own work or in the best handiwork of others, most strongly desire that the education authorities in this country will no longer delay the introduction of a system, the great usefulness of which has been so fully ascertained in other lands..."
"Public education, besides giving strength and health, must instill the duty and habit of work, because this is to all both a necessity and an advantage. I do not refer to a thorough knowledge of any particular kind of work, but rather to that energy, that activity, that industriousness, and that perseverance to the end, which characterize the life of every diligent individual. Educate such men, and the republic will see its fruits of agriculture and of industry redoubled. Instill in the child this need, this habit of work, and his future will be secured, as he will then be entirely dependent upon himself. I consider this part of education as the most important, and therefore my plan of general instruction contains manual labor as its vital feature. Of all the sources which are apt to stimulate the average child, none will produce a greater desire for activity than physical work." "By this bill which I lay before you, I hope to interest fathers, teachers and pupils. Fathers, because their taxes will be decreased; teachers, because they may hope for honor and recompense in this new field; and children, because the accomplishment of some real, material work will always be to them a source of great delight. I would desire that various kinds of handicraft work might be introduced." Unfortunately, Michael le Peletier was murdered in the year 1793 and it was nearly 100 years before his proposals bore fruit. "After carefully examining the work of our primary schools, it became apparent to me that the children were least of all occupied with those studies which would be of most service to them after the school period. I became convinced that this was the cause of much laziness and poverty, of unfruitful religious life, of neglect of God's decrees, and of great wickedness. I set myself the task of studying the nature of the child. "Before long I became convinced that our primary schools, even if they are worthy of being followed as examples in some respects, certainly do not come up to the highest standards, and, besides, do not in any way fulfill the aim of preparing the pupils for their life-work. It is not enough to cram the heads full of information, and take no step to create a love for work. Working classes and reading classes must be combined. This is the only way that industry can be made a national characteristic. I became all the more eager to bring about a reform, as my experience taught me that the most industrious people were always the most moral." Not being one to simply sit on his notions, Kinderman established a school. It is a relief to see in the news that employment numbers are improving and it will be a greater relief to see all in our nation restored to greater industriousness. Speaking of which, Von Helfest, writing in the late 180s wrote of Kinderman's effect on Bohemia. "We have little left of Kinderman's great labor, except the healthy efffect that can be traced as a direct result of his work. If Bohemia's industries rank highest in Austria, among the causes that have brought this happy result the influence of Ferdinand Kinderman, will not be forgotten. He had hardly any public support, but by his great wisdom and untiring energy he urged a collaboration with men of all classes. He has made the primary school the foundation of the welfare of our state. If you will ask the majority of those who during the early part of the century were successful farmers, thriving merchants, or wealthy manufacturers, to what cause they would attribute the first source of their material prosperity, I am sure they will without exception answer: 'It was the school which gave the love and desire for work and showed us the blessing of industry, order and economy.'" I was asked how can one measure and prove the value of woodworking education. Are there spillover effects, making a student better in math class because he or she had just spent 45 minutes using a tape measure, gauging proportions, considering fractions, checking for square and contemplating the shape of things? Anyone who had actually spent time in a wood shop would not need to ask the value of woodworking education. The unfortunate thing is that so very few administrators have actually spent time a the wood shop, testing and assessing their own mathematical, scientific, and aesthetic competence by doing real things. 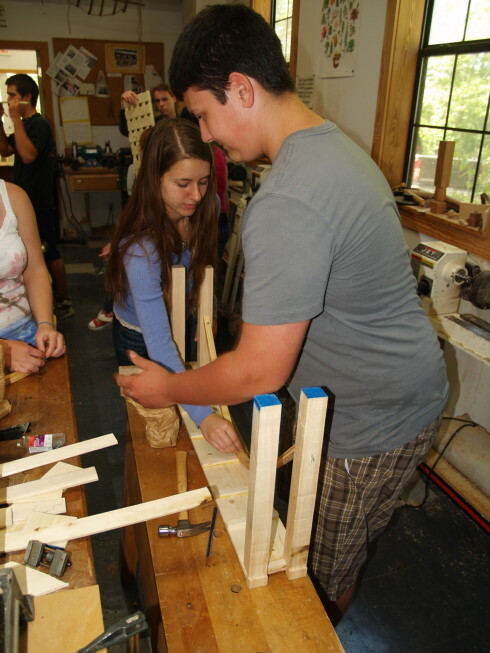 Are there spillover effects from wood shop, making students better listeners, more observant, more cooperative in class, better able to integrate their feelings about success, better able to sense the relevance of their being in school? I think these can be observed. But the value of woodworking is hard to measure in the exacting terms demanded by those administrators unschooled in wood shop and poorly observant of its effects. A few years ago, the National Endowment for the Arts proposed observing expressed joy as a criterion for determining program success. Schools these days are rarely concerned with joy. After all, how can one measure joy on a standardized test? It seems such an abstract notion. But joy is real and too often absent in American schooling. When we see students engaged at a deeper level, theirs according to the NEA is an expression of joy. When we see students enter a classroom and go straight to work without hesitation, it is an expression of joy. When students are hesitant to quit and move on to their next class, that is an expression of engagement and joy. When students go home from school and actually have something to share with parents about what they have accomplished in the course of the day, it is an expression of joy. Unfortunately, our current fixation on statistical data causes administrators to overlook valuable anecdotal evidence, just as they completely ignore the value of the observations and contributions of early educational theorists like Comenius, Pestalozzi, Froebel, Montessori, Dewey, Salomon and Cygnaeus. 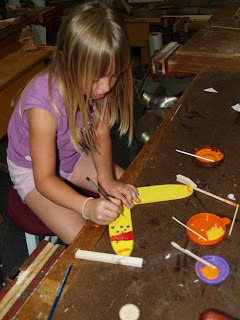 Today in the CSS wood shop, first, second and third grade students will be making vehicles (toy boats or planes) for imaginary travel to Australia. They are studying the continent, and getting there with all creative faculties intact is their first order of business. Children tell me that wood shop is their favorite class. In a real world, one concerned with joy and expressions of joy as a measure of educational success, that would be evidence enough. "There's a big room for improvement in how parents prioritize their time and what they're doing in the time they're spending with their pre-school children," said lead study author Dr. Pooja Tandon of Seattle Children's Research Institute. The American Academy of Pediatrics recommends children play outside as much as possible, for at least 60 minutes a day. Physical activity is not only good for weight control and preventing childhood obesity; previous research also suggests playing outside improves motor development, vision and vitamin D levels. "There is evidence that play - just sort of the act of playing - is important for children's development of their social skills and their peer interactions," Tandon said. "Being outdoors affords children an opportunity to play in ways that they may not get to when they're indoors." Too many parents are missing the boat. Today I had a full day of classes, 4th through 6th and 10th through 12th. The upper elementary students worked on their hand crafted travel journals, adding covers they have designed. The high school students were divided into groups rotating through two activities. A friend, Doug Powell, taught three at a time how to make beads from molten glass, while their math and science teacher and I worked with the rest building bridges as part of an exploration in physical science. Bending a laminated arch form. I can tell you very little about lamp work. But I can tell you how the bridge making is "structured." I prepared stock in various sizes that the students can use in building bridges. The span will be 30 inches. It's being conducted as a team challenge, with students working in groups of three. 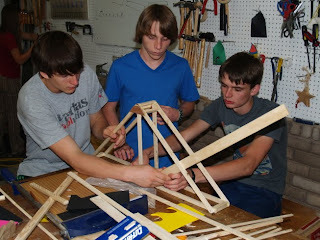 The winners will be those whose bridges actually support the most weight relative to the weight of the materials used. We will test them to the breaking point in about two weeks. On another subject, I finished photography for my American Woodworker article on a dedicated finger joint router set-up. The finished test joint and jig are shown in the photo above. One of the nice things about doing this joint on the router table rather than on the table saw is that it gives such clean cuts. What you see in the photo has not been sanded and yet shows a perfect fit. Another advantage is that no change from regular blade to dado blade is necessary. Making a dedicated router set-up is easy as I will explain in the article which will come out in the early summer. This may seem unrelated to the hands, but before I begin, let me remind you that the hands touch everything, and provide a sense of oneness as well as wonder as we sense and create. Imagine three trains passing through a station and each carries a powerful light. The first train is stopped perfectly still and the second train is in reverse at an incredible speed. The third is going forward at the same speed that number two travels in reverse. At the specific moment that the trains' headlights are aligned, their engineers turn the headlights on for a controlled interval, then off. From the vantage point of the engineers, the quality and the duration of light emitted from each train is the same. If you were at some distance and observed the lights of the three trains' you would notice that due to the constant speed of light, the measurable photons of all trains would arrive at the same time. An observer would also notice differences in the quality of light. The light waves from the train in reverse would show a "red shift" just as shown by those galaxies retreating from our own. The train approaching the observer would also show a change in the quality of light. The train standing still would show its light for a shorter period of time than the ones traveling at great speed, due to the relativity of time... The faster you go, the slower time passes. In other words, the speed of light is a constant, but its color (as expressed as wave length) and duration, describe the relationship between the train and an observer at a fixed point. That observer, far down the tracks, sees light either as photons, individual particles of light all arriving at the same time, or he may observe light as a wave, sensing its color, or he may observe its duration. It is difficult to do all three at the same time. This may be enough to send you off to the wood shop in search of something more tangible to get your hands on, but was the kind of mind exercise that had a huge effect on our understanding of the universe. A similar thought exercise led Einstein to discover the theory of relativity. Relativity also takes place with regard to our understanding of place and being as individuals. We either focus on separation between us, thus regarding ourselves and those objects and persons of our lives as separate entities, or we focus on the interrelationships, the waves and patterns that describe our own existence as inseparable from the vast matrix of human life. We have in any given moment, the opportunity to choose one reality or the other. And I suggest that our current plan of education reinforces a view of separation rather than one of wholeness. I would love to have my reader's comments on this. 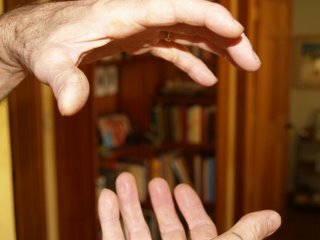 Can you see that the hands may engage us more deeply in connecting with other parts of our own being than our other senses, and in that may lead to transcendence? Imagine schools whose purpose became that of transcendence... the awakening of each child to greater purpose and sense of connection and relationship to the world that surrounds. That would be the process that Jung and others called individuation. Tonight the Eureka Springs School of the Arts holds its annual Re-Art fundraiser at the Inn of the Ozarks Convention Center, here in Eureka Springs. Attendance is free. Art is not. But it is a wonderful fundraising event. All proceeds go to the Eureka Springs School of the Arts.